These are a pair of affordable, highly comfortable and non-see through yoga pants. The opaque fabric is designed to boost your confidence for ultimate workout. These are perfect for gym, running, cycling and all sorts of workouts. These hugged-in and comfortable shapewear pants can be your perfect casual wear as well. These are made from 87% Polyester and 13% spandex blended material. 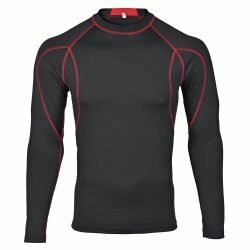 This material provides much needed compression to hug your body as a second skin for strong workout and recovery. This material also makes these pants highly moisture wicking to provide the peace of mind during your workout. The high rise and wide waist band is perfect and natural design for women’s workout. The hidden front waist pocket is ideal for key or card storage. Strong and multiple stitching at seams provides durability and longevity. Interlocked seams minimize chaffing. No annoying tags.